Wood fence is natural, versatile, and affordable. Custom panels are made to your specifications in our shop. We also offer prefabricated panels, and three varieties of post and rail fence. The durability and life-long strength of the polyvinyl chloride compounds used in the manufacturing of Vinyl Fence produce a traditional fence that endures rugged use and the test of time. 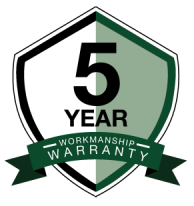 We stand behind our work with a five year workmanship warranty. If a post moves or a gate doesn’t close right, we’ll fix it at no charge. I am writing because the crew that worked on my property were the most impressive workmen I have ever seen. They were prompt. They were neat. They were polite and considerate of my extensive landscaping. They have a vigorous work ethic and skill. They were friendly and cheerful as they worked. It was a joy to have them about, and I actually missed them when they left. The quality of your entire business, from the initial telephone contact….is the best I’ve ever seen. (The installation team) did a fantastic job. They were friendly, neat and worked non stop until the job was done. We have thoroughly enjoyed the latter end of the summer because of this fence and look forward to many, many more years of doing so! Thank you so much for all you did for me. The speed with which the fence went up - your expert advice on what kind of fence - your awareness of every color and explaining them to me - all make it a great experience. The house sold within 2 days of fence installation - I guess it worked! I couldn't be happier with my fence! Of course the crew was fantastic, left not one remnant of my old fence or debris from the job. Completed my whole property in one day and it looks amazing. They couldn't be more professional and wonderful to work with. This exceeded my expectations and i'll recommend The Fence Guys to everyone!! Will use the Fence Guys for my future fencing, and will recommend to everyone I talk to that needs a fence! The process was super easy and fast. After talking with Dave he knew exactly what we wanted. The crew was so nice and efficient. And the new fence looks amazing! I wanted to express my thanks to you and your staff for your professionalism and workmanship completing my recent fence installation. It was my pleasure to contract with The Fence Guys for the project. The installation, quality of materials and follow-up exceeded my expectations. I just wanted to thank you for doing a fantastic job on our fence. The work was done quickly and professionally and looks fantastic. Please feel free to use me as a reference. Your company is very impressive. I will be sure to recommend you to friends and neighbors. You guys did an amazing job on the fence! From the removal of the existing vinyl fence, to the installation of our gorgeous new aluminum fencing....we could not have had a better experience. We absolutely love it and cannot thank you enough. This is just to thank you guys for a job well done on our fence. The quality of the fence is great and we were very happy with the installation. We have already received very good comments from neighbors and hope to pass along some business your way in the new year! It was a pleasure to have such nice, hard working guys on the property. This was a big purchase for us, and the fencing is a big part of our landscape and house renovations, so I really appreciate knowing that a job was well done. They are all great guys……you are lucky to have them! …..this level of access and responsiveness is not only exceptional, it is unheard of in the contractor business…. Your company displayed incredible professionalism. I would recommend The Fence Guys to anyone, and invite you to use my name as a reference as often as you like. You did a great job at a fair price, and I’m quite happy to have worked with you. ….you don’t see that kind of service/ consideration in today’s world and I am certainly glad I chose The Fence Guys to put my fence up. Thank you for OUTSTANDING customer service – very much appreciated. Just a note to say thanks and to tell you how great our new fence looks. It's as if it has been there the while time! We love it! I am so thankful for the wonderful fence that you guys installed. The end product is excellent. What can I say? I love the fence you recently installed at my new home. My husband and son said I would ruin the look of my extensive front lawn by putting up such a barrier but it anything the finely crafted fence and the expert installation makes the house look quite lovely. My neighbors have admired it also. As it turns out my guys were wrong and yours were right on. I write just to say thank you a million for being so prompt in getting out to the house to check out our concern. You are sincere and genuine which make you someone others can relate to and appreciate. Our character and reputation are the only things that will carry us to thinks that matter most. I thank you for both and for all who assisted us in this matter. Thank you very much. The fence looks great. You guys were professional, friendly and a pleasure to have around. I will definitely recommend you to friends and family. Great job! The fence looks terrific. I also appreciate your responsiveness and the fact that everyone I have dealt with from your company has been very pleasant. Thanks again.